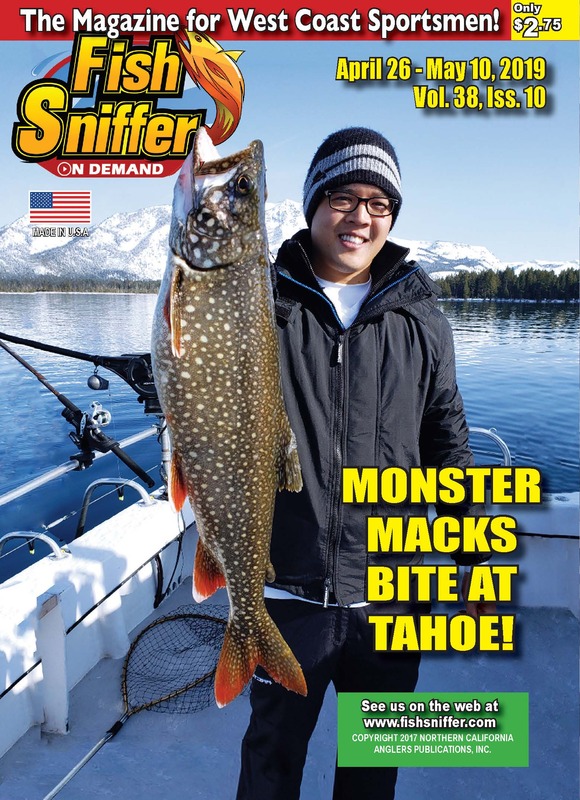 In spite of the forecast of modest numbers of salmon on the ocean this season by the National Marine Fisheries Service (NMFS), this has turned out to be a surprisingly good year for Chinook fishing in the ocean and the Sacramento and Feather rivers to date. Dr. Michael O’Farrell, NMFS scientist, forecasted approximately 229,400 Sacramento River fall Chinook adults would be swimming on the ocean this year, but the number that actually showed up appears to be much larger. 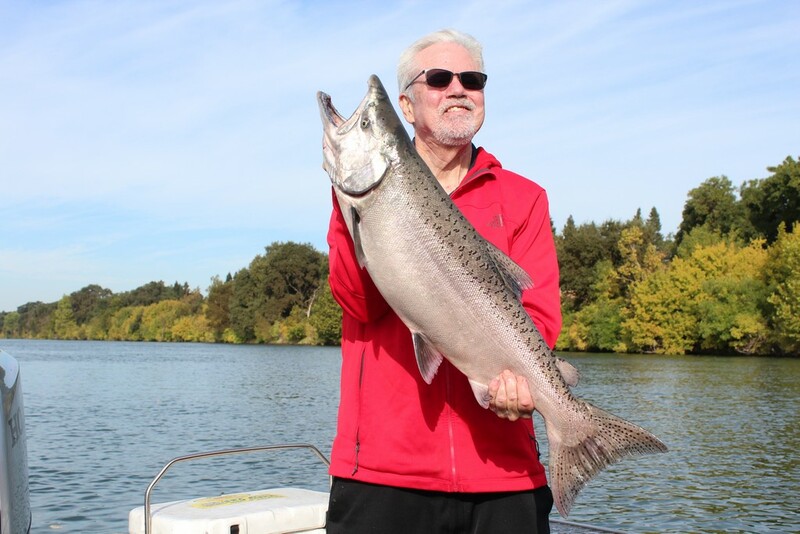 The top-notch fishing for salmon that anglers have experienced on the Sacramento in the State Capitol was underscored by the recent trip I made with Monte Smith of Gold Country Sportfishing. After Smith launched at the Sacramento Yacht Harbor boat ramp, we began trolling Brad’s Cut Plugs behind Pro-Troll Flashers.in the chilly pre-dawn darkness below Miller Park. Fishing with us were Michael Abourezk and Charles Wilson. 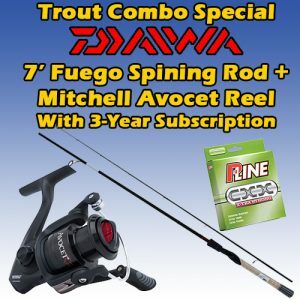 Smith put out 9-1/2 feet Phenix Trifecta rods, teamed up with Shimano Tekota line counter reels filled with 40 lb. P-Line Braid. The day began with a sizzle, as both Abourezk and Wilson landed their one fish limits to 14 pounds by 7:30 am. Both fish were bright kings that had apparently just moved up from the ocean. Now it was time for Captain Smith and I to catch our limits. Smith decided to move downriver below Garcia Bend. After a couple of hours without hook-ups, one of the rod tips went down as a salmon grabbed the plug and I began reeling the fish in. Smith netted the beauty after it put up a dogged battle. It weighed 17 pounds and was the day’s biggest fish. Finally, around noon, Smith filled out his limit with another shiny salmon around 8 pounds. We were done in time for lunch while fishing in the heart of the bustling Sacramento metropolitan area. A couple of weeks after our trip, Abourezk and Wilson made another trip with Smith that produced limits in downtown Sacramento. ‘This trip was great,” said Smith. “We ended up two salmon and a third one for myself, along with two other hard grabs, all by 8:30 a.m. Two fish were smaller and one weighed 14 pounds.,” said Smith. 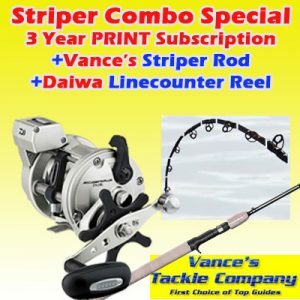 Other guides reported top-notch fishing in the Sacramento area also. 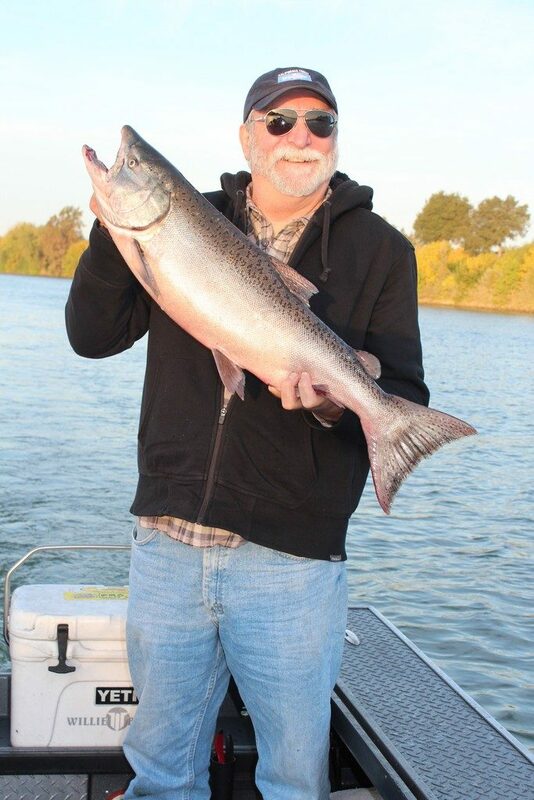 On October 25, James Netzel of Tight Lines Guide Service reported four limits of Chinook salmon ranging from 6 to 22 pounds,” while trolling at Garcia Bend. The anglers trolled with Brad’s Cut Plugs behind Pro-Troll flashers. Salmon are being hooked by bank anglers and boaters on the Sacramento from below Vieira’s Resort in Isleton all of the way upriver to Verona now. Information: (209) 581- 4734. 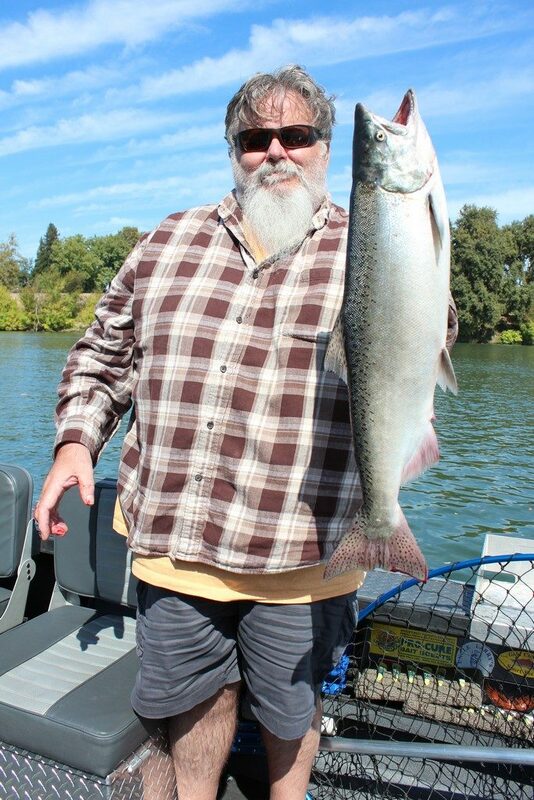 Guides now fishing for salmon on the Sacramento River include: Monte Smith, Gold Country Sportfishing (209) 581-4734; James Netzel of Tight Lines Guide Service (888) 975-0990; Bret Brady of Bare Bones Guide Service (530) 272-7137 or (530) 263-4451; Rob Reimers of Rustic Rob’s Guide Service, (530) 632-0051; Jerry Lampkin of TNG Motor Sports Guide Service, (530) 320-0994; Robert Weese of Northern California Guide Service (530) 755-7196; and Mike Bogue of Mike Bogue’s Guide Service (530) 246-8457.